Rees Tyler of Gilbert High School made the biggest jump from the 2016 State meet to the 2017 State meet. In 2016, Rees finished in 61st and was the 6th best finisher. This year he moved up 55 places and finished 6th place overall. The next biggest improvement was Andrew Kephart from Decorah High School, who finished in 3rd place in 2017 after finishing 39th place the year before. In 2015 he did finish in 11th place, though this year was his highest finish yet. Nathan Patel of Grinnell was another runner who made a huge jump. His freshman year he ran 17:14 and finished in 45th place. This year he was able to run a PR at the state meet with a time of 16:29. This was good enough for a 35 place improvement and a 10th place finish. On the girls' side, Caroline McMartin of Pella made the biggest jump from 2016 to 2017. She was the 67th place finisher the previous year and moved up 56 spots this year to finish in 11th place. This big improvement help lead Pella to a second place finish in the team competition. 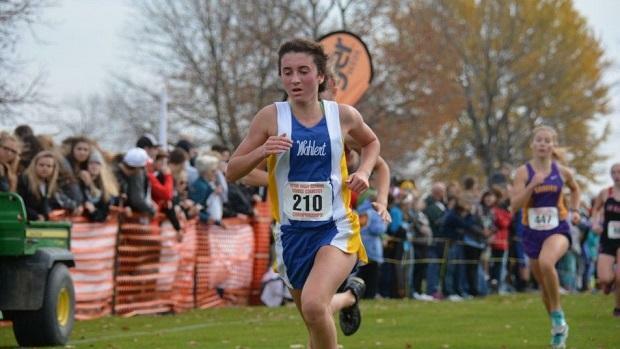 The team champs, Dubuque Wahlert, had Kaylee Osterberger with a huge improvement to help them win. She was the 51st best 3A runner in 2016 but in 2017 she was the 10 place finisher, an improvement of 41 points which was the difference in them winning this year. Another runner that had a great day in 2017 was Bryce Gidel of Humboldt High School. As a freshman she was the 34th place finisher at Fort Dodge, but this year she was able to move up to 5th place. Check out our predictions for next year's State meet!